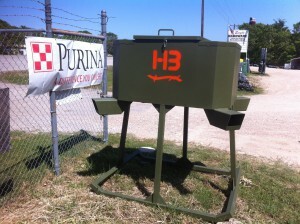 Eagle Hardware Farm and Ranch is a proud new distributor of HB Hunting Products. Located in north Texas, HB Hunting Products are made from the highest quality steel that will withstand the outdoor elements for years of hunting. This entry was posted on Monday, April 29th, 2013 at 11:36 am	and is filed under News & Updates, Wildlife, Deer. You can follow any responses to this entry through the RSS 2.0 feed. Both comments and pings are currently closed.